I'm so excited I can hardly contain myself!! Well, if I can't contain myself, what can I contain? How about some plants! I call myself a "pot freak" because I cannot pass up an interesting container to add to my collection. At last count, I had 80 pots. Now, I must admit that is a little over the top, but hey, I only have a few pair of shoes in my closet. So there you go! There are so many types of containers on the market today. The most common is a simple terracotta pot; but ceramic, stone, plastic, glazed, fiberglass, wood, hypertufa, and concrete are also available, just to name a few. Pretty much, the sky is the limit when it comes to container gardening. If you can fit enough soil into something for a plant to grow and it has a drain hole, it has now become a container for your garden. How about an old boot? A birdcage, maybe? Step outside of the planter box, and try something unusual for your next container. Different types of containers have their pros and cons. Some are subject to freezing, cracking, or rotting; some will last for years; some are heavy, some are lightweight; some are inexpensive, some a little pricey. I'll let you do the investigating to see what would be best for your budget and design. As any good gardener knows, our plants will only do as well as the "soil" they are growing in. Mixes for containers are available under a variety of trade names and are usually referred to as "soil-less" mixes. These soil-less mixes may contain peat moss, vermiculite, perlite, bark, or coir fiber (ground coconut hulls). What I usually do is buy a good quality potting soil, then I add a little compost to add some "life" to the mix, and I also add a little expanded shale to ensure good drainage, and I'm ready to plant. Containers should be filled to within about one inch of the top to allow room for water. 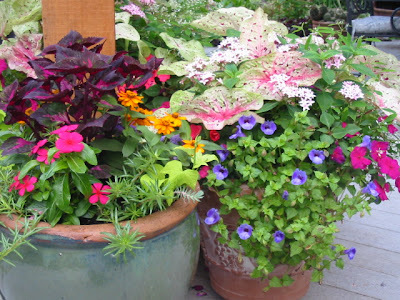 Your containers will drain better if the soil mix goes all the way to the bottom of your pot and you do not add any gravel or filler in the bottom of the pot. Now for the good part, the plants!!! and a "spiller" (plants that trail over the edge). How about a container filled with a variety of Caladiums, Red Dragonwing Begonias, and Creeping Jenny for a shady spot. Or try Red Cordyline (Ti Plant), Purple Pentas, and Sweet Potato Vine for a partial sun/shade area. For a full sun spot, try Purple Fountaingrass and Sweet Potato Vine, or Variegated Tapioca with Blue Daze spilling over the side. 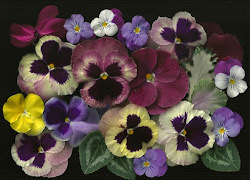 A suggestion from the April 2011 Southern Living magazine is to first find a foliage plant that you love. Then choose a second foliage plant with complementary hues and contrasting textures. And finally, add a bloom that pulls it all together. Once you've got your containers filled with colorful combinations, you will need to fertilize periodically and water as needed. 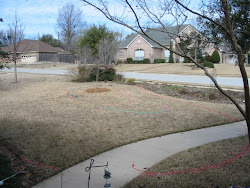 You can use a water soluble fertilizer or a granular time-released fertilizer. What I usually do is just save a little of the organic granular fertilizer that I use in my perennial beds and sprinkle some of it in my containers a few times a season. If your containers are in a shady spot, you may only need to water once a week or every few days. 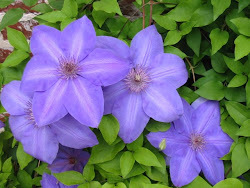 If they are in full sun, you may need to water as often as every day in the middle of the summer. Stick your finger into the potting soil; if the soil is dry, then water; if it is moist, hold off for another day or so and check it again. We can kill plants by over watering more often than under watering. 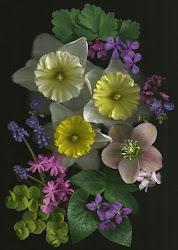 By far the best container book I've ever had is called Easy Container Gardens by Pamela Crawford. 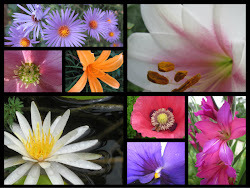 She gives great plant combination ideas, and they all work for our Zone 7/8 climate! 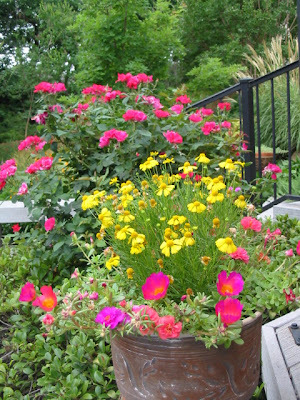 For even more great plant suggestions for your containers, go to www.dallasplanttrials.org. Jimmy Turner with the Dallas Arboretum has lists of tried-and-true annuals for our area. I hope I've inspired you to pot up some colorful containers for your garden this spring. Maybe you'll even add a few new containers to your collection, too. Toni, 80 containers? Wow! I can just see all the colorful arrangements all over your garden, though. How beautiful they are. I just wish I had as much energy as you to tend to all those containers. Great post with some wonderful information and ideas! Fabulous! I love the book suggestion. I'm always looking for inspiration. Your pot suggestions are timely - I'm still working on a few! Thanks Toni! Yours are very pretty. I'm not much of a container gardener. (They dry out too fast here.) Although, every year I say I'm going to try again - they are so nice and welcoming. Beautiful pots, Toni! Ahem...Ok...so I have nearly 80 pair of shoes in my closet...but you have me way beat on pots! But your pots are beautiful and so colorful. I like the "thriller, filler, spiller" mantra. Very good to remember...and I will since I'm not very good at container gardens. But your post has inspired me! Thank you! Wow 80 pots! I understand how you got there though. I have a collection of pots just waiting for some plants to call them home. Thanks for all the suggestions. Your combinations are beautiful! Diane, 80 pairs of shoes and puppies? Toni, beautiful container designs and great tips. I have to admit, this year the containers get culled, I can not water so many and I do not have 80. Your combination of plants are stunning. Thanks for the tips. I like the idea of a thriller, filler and a spiller. 80 pots!?! Holy kimoly!!! :) Your containers are beautiful - I alas, forget that containers need watered & mine usually die. Beautiful containers and I love the mix of plants you have used. I too, have a lot of containers and am always looking for inspiration for new combinations - so thanks! I have a lot of shade, so the caladiums are a given for me. I love the variety, texture and form they provide. great ideas and information...love some of the ideas and I am a container crazy person too...I have my collection I plant every year which is so much creative fun...this year I am adding more edibles to those containers to add to my veggie/herb garden space and cut down on annual plant expense...I will have to see how I like it...let you know!! I feel SO much better, knowing that someone else has such a container collection!! I agree, I'd much rather store pots than shoes and why NOT use the walk in closet for just that! LOVE containers, been a lifesaver for me, as I have heavy clay soil that is so difficult here in the midwest. Thanks for your awesome ideas..what a cheery blog! My neighbor and co-worker uses beer to fertilize their plants. I must say it sound strange. But they have the most beautiful gardens and containers. Could add an Esperanza as the "thriller" and the croton would become the "filler." Or you could add 'Profusion' Zinnas as the filler, using the Croton as the "thriller." 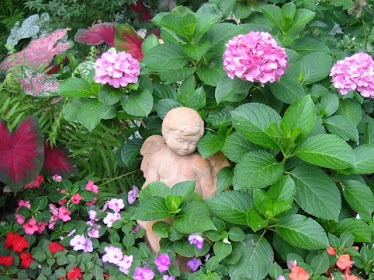 I have also used hot pink or red Pentas as fillers with crotons and they look great. You could do both Esperanza (yellow) and red Pentas. That gets my vote. Have fun!! How do you keep them all watered? I love reading through your blog. Great! This is a good information of the computer services articles and really like your site, Please keep sharing more and more information. Wish you best of luck for all your best efforts. It is one of the best post from other. It is a useful and charming post. I adore this post and your other container crazy post. I pinned it on Pinterest years ago and finally went "ape" at Calloways last week. I had to bring my Angelonia inside as it did not like our sub 50 degree nights that we've had this weekend. I cannot find any yellow esperanza in a bucket smaller than a gallon. Do you find them and if so, where? If not, any suggestions for a yellow, sun-loving thriller that will bloom all summer that doesn't come in shrub size? Great information shared. 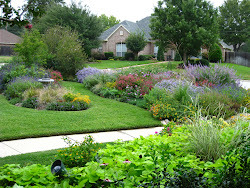 Another great Landscaping Raleigh, NC, they provide great services. Looking forward to more great information. Just someone who loves to dig in the dirt and share what I have learned over the years...and am still learning. Spring in Austin Feels Like All Things Are Possible!